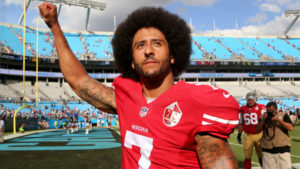 In a letter mailed today, the nation’s oldest civil rights organization is requesting a meeting with NFL Commissioner Roger Goodell to discuss the issue of First Amendment rights and free speech issues surrounding players, including former San Francisco 49er’s quarterback, Colin Kaepernick. The NAACP’s regional branches including the New York and Conneticut State Conferences, the Providence Youth Council and the St. John’s University College Chapter will also participate in the New York City-based “United We Stand” rally in support of Colin Kaepernick’s right to free speech, which will take place on August 23, 2017 at 5:00pm in front of the NFL Headquarters at 345 Park Avenue, New York, NY. New York State Conference President, Dr. Hazel Dukes, and National Youth and College Coordinator, Anthony Davis, will speak at the rally. Organized by a coalition of civil rights, faith-based and civic organizations including The Justice League NYC, The People’s Consortium for Human and Civil Rights, Rainbow PUSH Coalition, Tamika Mallory and Symone Sanders, the rally will draw attention to the quarterback’s current situation: Although the NFL is well-into the pre-season, Kaepernick remains a free agent, unsigned by any of the 32 teams in the league.